About Us Lapole Electric, LLC. Here at Lapole Electric, we work quickly and efficiently for the lowest competitive price. We strive to offer the best customer service and quality to your new or existing home. We specialize in a wide array of electrical services for all your residential needs; beginning at the early design stages to after the home is lived in. We have been in business since 2005, and we are proud of the relationships we have developed and the repeat business we have gained from those relationships. Gary has over 30 years of experience in running, supervising and bidding all phases of residential work. 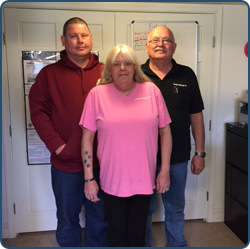 Edna Mae, Master Electrician - State License Number 11523, has over 25 years of experience in running work, supervising, purchasing and handling material. Jim has over 15 years of experience in all phases of residential wiring, supervision, and bidding work.